When I considered stepping into the Ultimate Truck, I wanted the best, the biggest and baddest truck of them all. Obviously there is nothing that beats the F350 Super duty Long box, crew cab dually for both maximum towing power as well as a luxurious and comfortable daily driver! And boy did it ever turn out perfect! It gets fuel mileage better than most luxury cars, contains as much luxury as most luxury cars, and at the same time tows more than what most pickups ever could dream of. All in one very classy and sharp looking package. My wife did not feel comfortable towing our 28' trailer with our Excursion, but she loves to tow with this amazing truck! but, even if you never planned on towing anything, you will love this truck and boy, does it ever get the looks and compliments! This truck drives and rides and performs far better than any F-350 off the show room due to all the upgrades and improvements made. 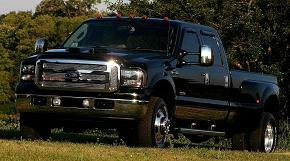 This beautiful F-350 Rides smooth and quiet. The engine starts right up and purrs like a freshly fed tiger, and starts without needing to be plugged in down to zero degrees Fahrenheit and below. Starts easily at 25 below zero and lower with the block heater plugged in. The new transmission shifts smooth and firm, perfectly and solid every time. The suspension rides much smoother than you might ever imagine, partly due to the softest front springs available and the cushy double bellows air suspension in back. Yet it will haul 6,000 pounds in the bed on the gooseneck hitch as if it wasn't even there. Side by side this truck rides far smoother than my 2004 Excursion. It steers perfectly and the truck is silent going down the road, no squeaks or rattles. This truck gets a good going through three times a year to keep it in tip top shape so this rig is ready to roll and if you wanted to take a 10,000 mile round trip to the very northern tip of Alaska right now, it's ready to go! A well maintained and well cared for diesel, such as this, can easily hit 300,000 miles and more and still keep on going. Most of it's life it has been driven as a daily driver as well as towing heavy and hard across country. It performs exceptionally in both environments, and was built to do just that. The Ford Kentucky Truck plant in Louisville makes the Super Duty trucks we use for our projects. When we set out to create a project truck using the best of the best equipment and components, you have to start out with the best... and the best is the Ford Super duty, hands down! The kind and proud folks at the Kentucky Truck Plant have extended gracious benefits along the way such as expeditious production getting our trucks to us in half the normal time, making advantageous changes to the build while in production, and even custom painting our truck with extra coats of paint and a hand buffing the finish tom a show quality shine, as well as a personal hands-on quality inspection of the final build! We also are very appreciative of the extra special care after the build with custom components, trying out prototype parts and receiving the latest technical intelligence making our trucks a product of cutting edge technology and top performance, at all times!